Homo heidelbergensis is an extinct species of the genus Homo which lived in Africa, Europe and western Asia from at least 600 000 years ago, and may date back 1 300 000 years. It survived until 200 000 to 250 000 years ago. 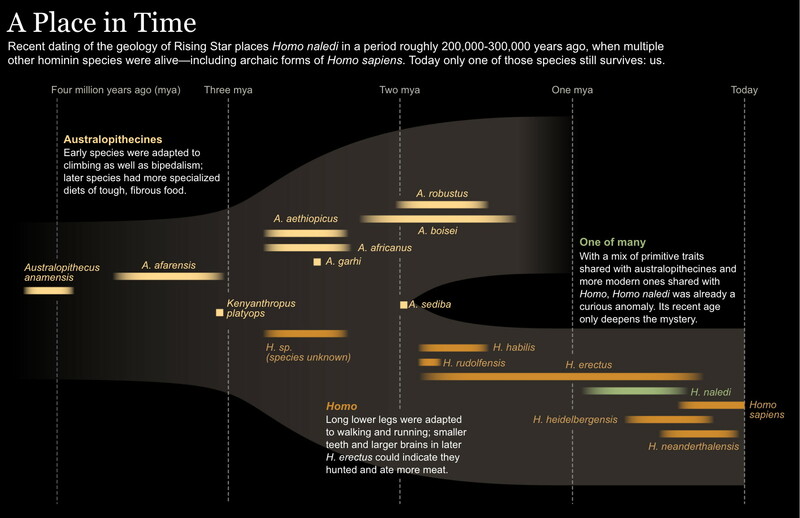 It is probably the ancestor of Homo sapiens in Africa and the Neanderthals in Europe, and perhaps also the Denisovans in Asia. It was first discovered near Heidelberg in Germany in 1907 and named by Otto Schoetensack. The general area of the find, with the site of Gruta da Aroeira circled. A large international research team, directed by the Portuguese archaeologist João Zilhão and including Binghamton University anthropologist Rolf Quam, has found the oldest fossil human cranium in Portugal, marking an important contribution to knowledge of human evolution during the middle Pleistocene in Europe and to the origin of the Neandertals. 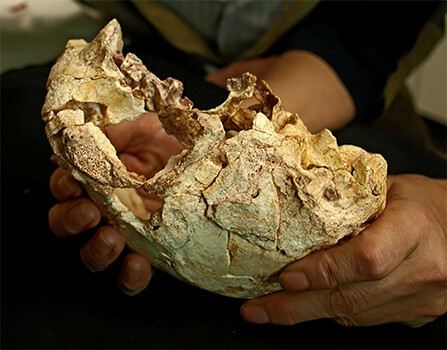 The cranium represents the westernmost human fossil ever found in Europe during the middle Pleistocene epoch and one of the earliest on this continent to be associated with the Acheulean stone tool industry. In contrast to other fossils from this same time period, many of which are poorly dated or lack a clear archaeological context, the cranium discovered in the cave of Aroeira in Portugal is well-dated to 400 000 years ago and appeared in association with abundant faunal remains and stone tools, including numerous bifaces (handaxes). Firmly dated to 390–436 ka, this new hominin fossil found in Portugal is the westernmost Middle Pleistocene cranium of Europe. It is one of the earliest fossils associated with Acheulean tools in Western Europe. Together with the tools, there is also a direct association with a large amount of faunal remains: mainly cervids and equids, as well as some rhinos and bears, a large bovid, a caprid and a tortoise. 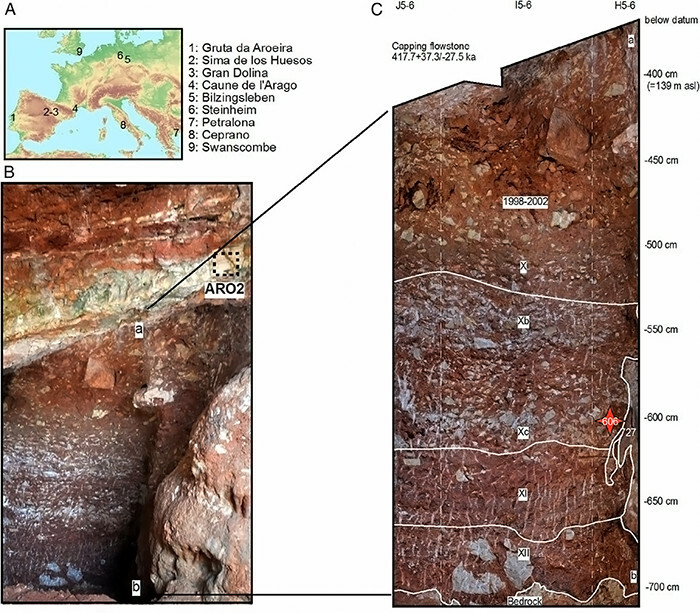 The Almonda karst system (Central Portugal) has yielded since 1987 evidence of humans from different Paleolithic and Neolithic periods. 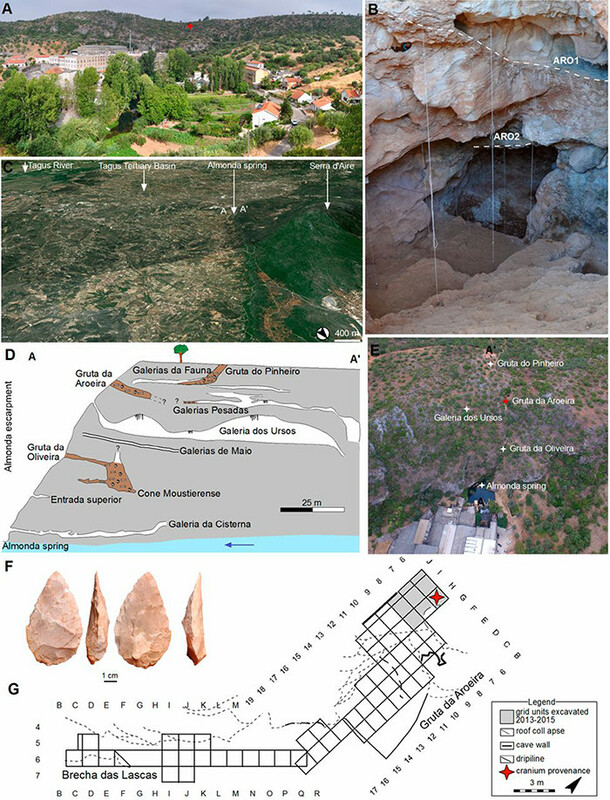 The excavations at Gruta da Aroeira from 1998–2002 produced many important finds: Acheulean bifaces associated with faunal remains and two human teeth (Aroeira 1 canine and Aroreira 2 third molar), which are very large but within the known variation of the dentition from the European Middle Pleistocene. In 2013 new works started at the cave, using a heavy-duty demolition hammer to excavate the hard breccia of the sediments. The Aroeira 3 human cranium was heavily fossilised and well preserved within the cemented breccia, and was damaged by the hammer, fragmenting several pieces and producing a hole in the main portion. 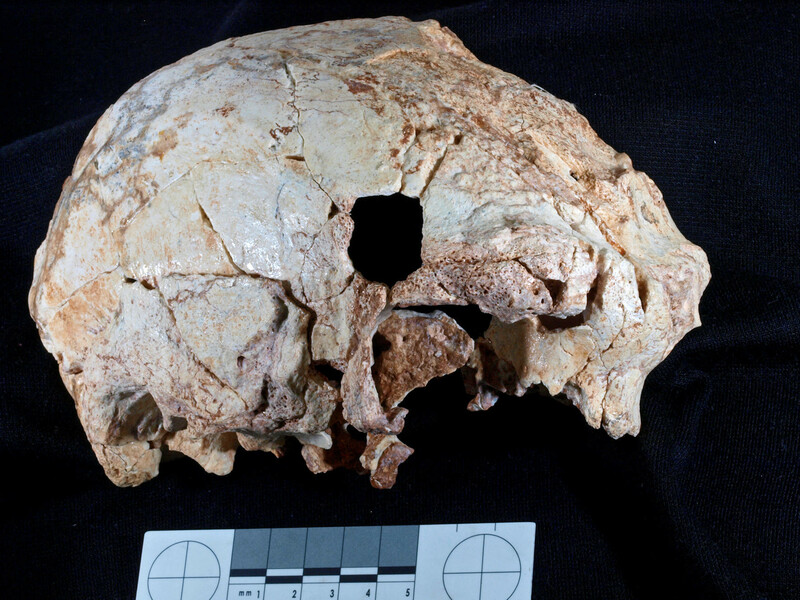 The cranium was restored in Madrid over a period of two years. (A) Almonda escarpment with the position of Gruta da Aroeira and the Almonda River in the foreground. (B) General view of Gruta da Aroeira and the location of the main dated speleothems. (C) Estremadura Limestone Massif with the position of the Almonda spring, the Tagus River, and the Serra d’Aire. (D) Schematic cross-section of the Almonda karst system. (E) Almonda escarpment with the position of Gruta da Aroeira and the Almonda River in the foreground. (F) Acheulean biface (flint) from level Xb/c. (G) Gruta da Aroeira site plan. (A) Geographical location of Gruta da Aroeira and main sites mentioned in the paper. (B) Detail of the excavation area and provenance of the ARO2 U-series sample. 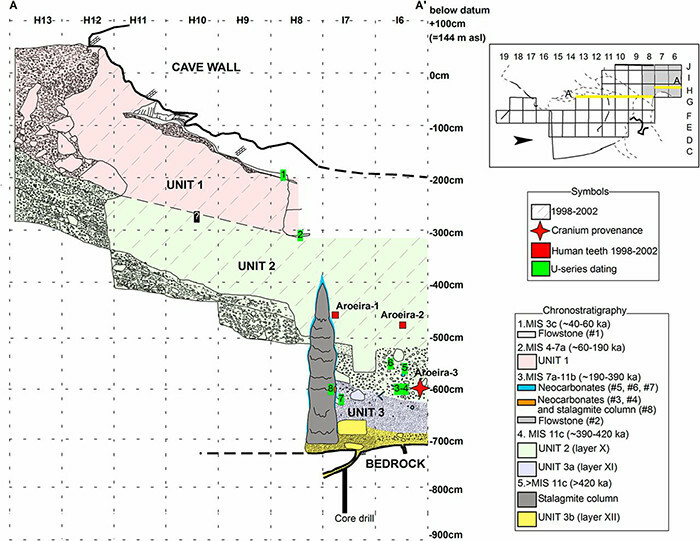 (C) Stratigraphic profile and cranium provenance (denoted by its field inventory no. 606). 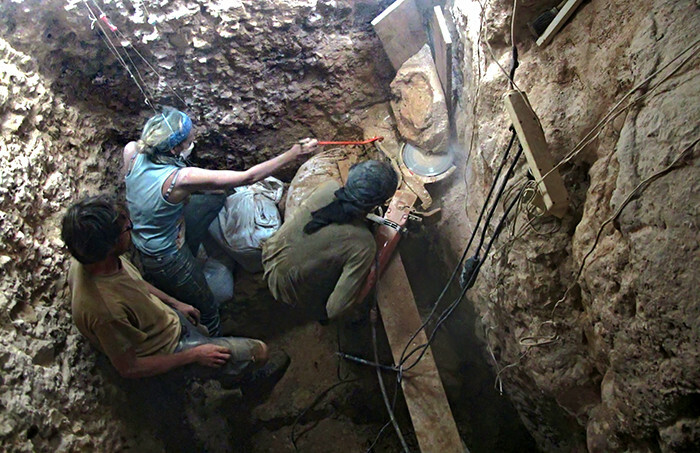 The team removing the deposit containing the skull. Heavy machinery had to be used in order to recover the skull for later removal from the matrix, and subsequent reconstruction. 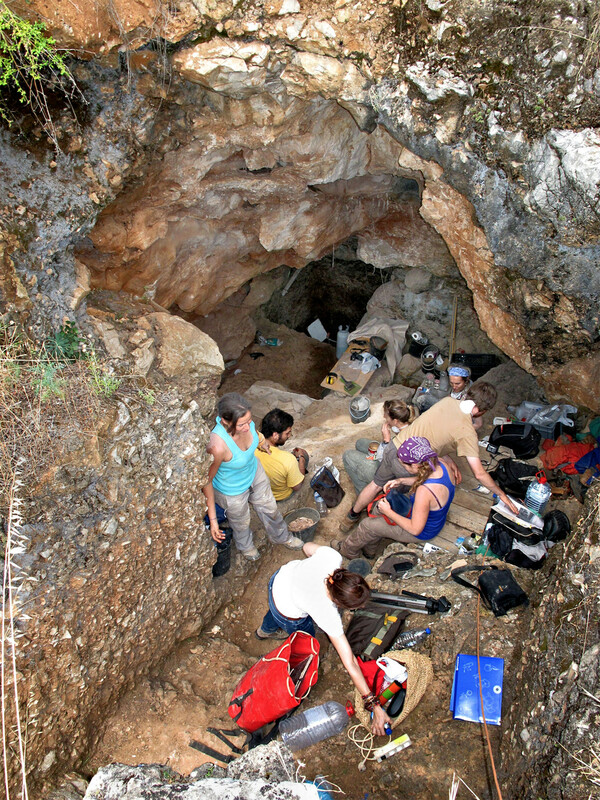 The team from the Archeology Centre of the University of Lisbon at the entrance of the cave of Aroreira, enjoying a break. Conditions at the site were difficult. The skull in the process of restoration. 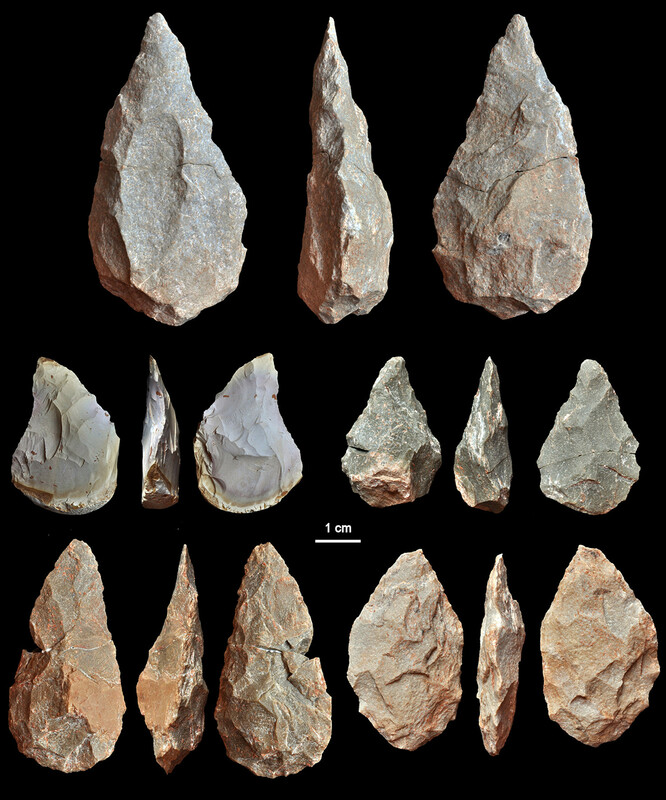 Five Acheulean handaxes (bifaces) from level Xb/c, the general part of the coupe where the cranium was found. Second row, first three images, made of flint. The other four tools are of quartzite. Virtual reconstruction of the Aroeira 3 cranium in frontal (A), posterior (B), superior (C), and endocranial (D) views. The frontal sinus in D is exposed in a parasagittal section located 4 mm to the right of the sagittal plane. 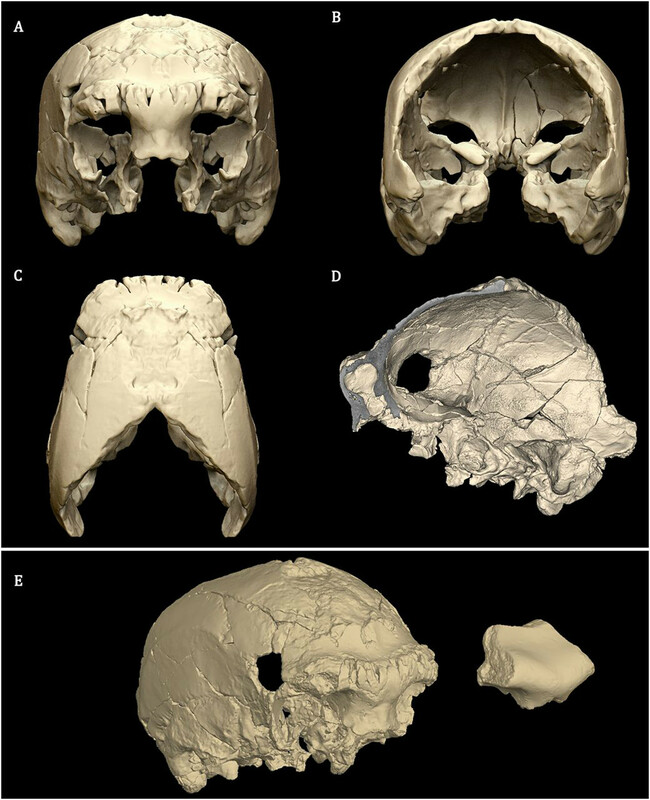 (E) Virtual reconstruction of the Aroeira 3 cranium in a three-quarters view compared with Bilzingsleben B1 (cast). Stratigraphic longitudinal profile of the Gruta da Aroeira, with the location of dating samples (nos.1–8) and human remains indicated. (A and B) The Aroeira 1 left mandibular canine (A) and the Aroeira 2 left maxillary third molar (B) in mesial (Mes), distal (Dist), buccal (Bucc), and lingual view (Ling). (C) Aroeira 3 maxilla in medial view. Arrows indicate the lateral nasal crest (1), turbinal crest (2); nasal floor (3), and root of the inferior nasal concha (4).